A lot of the programs I have done are good for starting out as well…21 Day Fix is a great start – modifier, easy to follow nutrition plan, sets you up for success long term. Where Turbo Jam differs is that I really can’t say it feels like a workout. I tell people that Turbo is something I’d do even if it didn’t burn calories. It’s my soul mate workout. Just super fun. I did two Turbo Jam videos this weekend – Ab Jam (20 minute mix of standing and floor abs) and Cardio Party 3 (50 minutes of kickboxing and smiling). It was so much fun to let loose in my living room. I do laugh with Shaun T, but not like this! Blah blah blah…new moms don’t have time to sleep. You’ve heard it, maybe lived it, so I don’t need to talk about that. What I didn’t expect was how the quality of my actual sleep times would change. Luckily for the better! I have not been a good sleeper since I was about 7, though I hear that I slept most of the time until then. I’m a light sleeper, waking up easily, but not falling asleep very quickly. I need a lot of wind down time. The time it takes me to fall asleep now hasn’t been consistently better, but I am sleeping more soundly. We used to joke that my husband would never be awoken by the baby crying, only by me waking him. But some nights he hears her first. And where I would normally wake up at any time of the night with little problem, some of these middle of the night wake ups have me scrambling for what’s going on for a bit. I’m not complaining. I usually have the baby monitor next to my head so even if my husband is waking first, I wouldn’t be long after. It is nice to be waking only because of the baby – not 50 other times for no good reason like I used to (even before pregnancy). Next week, I start setting the alarm again. I go back to work on Friday and Zoe is starting day care on Monday so that I’m less worried come Friday. I know day care is a good thing for her. She’ll socialize, pick up some germs and get ready for school later on. But not being with her all the time after 4 months together is going to be so odd. She is getting better at the gym child care center though I still try to not take the full two hours she is usually scheduled. But that is a little while with me in the same building! My husband will be doing the dropping off and picking up most days so I’m hoping to be able to workout once they go and not need to do it so late. 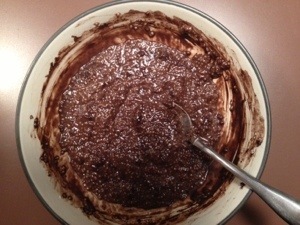 Other things going on…I made chocolate chia pudding last night. It was good, but I may tweak it a little. I used dark cocoa powder and stevia in the raw, so I’ll need to find a good ratio. I’m also thinking it would be good to put some protein powder in. I’ll play and share what I did. Also, I’m really enjoying Les Mills Pump so far! This week is a bit of a learning week, with Pump Challenge – a short workout that mostly prepares you for future workouts. I like that it has a choose your own cardio component because I also want to run and do Turbo workouts. It gives me the freedom to do those without feeling that I’m taking away from the program as written. It’s snowing here so we’ll see what happens with today’s planned run. I will not be running outside, that’s for sure. Have a great Friday! A bit over a week into my workouts and I’m amazed. Amazed at how tough of a time I’m having. I knew it would be different, but I guess I figured I would have kept at least some strength and flexibility with working out through my pregnancy. I’m sure part of it is me being critical, but it’s hard. I am physically bigger. This makes just moving my body more difficult (but burns more calories!) and also means that sometimes I get in my own way. I also have changed shape in many ways over the last year. I sometimes still expect my pregnant belly to be there, still think my thighs and hips are smaller and still think I know what to do to be in balance. But my belly is an entirely new shape, I have pounds distributed in new places and I don’t know how to balance this body easily. I have a weaker core. I haven’t worked my core directly since last March as even early on it made me nauseous. This changes everything from actually doing abdominal work such as planks to jumps and other plyometrics or strength moves like push ups. Today, I did two workouts that really showed this – TurboFire Core20 and Stretch40. The stretch workout was like a yoga class and so much was harder than expected. I have this on schedule once a week for the next 7 weeks and I will look back at this post, hopefully with improved strength and flexibility. I know that I will not be the same, but that I will lose the weight and gain the strength. I have done this before under different circumstances – first coming from being overweight all along and doing it all for the first time and now going from several hot yoga classes, being able to lift heavy and move with both grace and strength in my cardio to, well, not. However I also have a good reason for this different body! So that is a plus on the mental side. I am coming at it as a happy challenge. I look forward to the new changes and the fun workouts. I will work to get my body back to the healthy person my brain remembers so I can be a healthy mother to my child. I was talking to someone last night about fitness who thought his workout was the best ever. He’s not the first person I’ve spoken to that felt this way, and I’m sure he won’t be the last so no need for detail on his workouts. There are a lot of workout plans out there. And a lot of methods to work your body. Everyone thinks that their way is the best way. Sure, it is the best way…for them. The best workout for you is the one you will do! I love my Turbo…Jam, Fire, Kick because I find it fun and it is also an excellent workout. I would love it if everyone I knew tried it because I enjoy sharing it. But I realize that not everyone will love it as much as I do. That’s why other workouts exist. This is part of the reason I became a coach. It makes me happy when I can help someone find a workout that they enjoy as much as I enjoy mine. I don’t only do Turbo type workouts. I also like to lift weights (yes, I actually like it), yoga, sometimes I find running enjoyable and many more. I also like trying new things to see if something surprises me. I feel similarly about a lot of fitness related topics. The best time to work out is the time you will do it. The best time to drink Shakeology is the time it helps you the most. The best eating plan is the one you can stick with for the long haul. So there’s my take on it all. 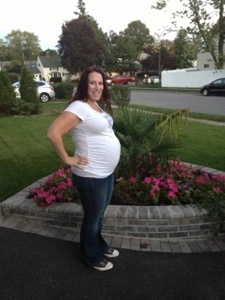 To lighten it up and prove that I don’t always wear lounging pants and tank tops here is a belly picture from yesterday…36 weeks and 1 day. Happy Friday! When I have all the time in the world to post, I have nothing to say…when I do a bunch, I have little time! Isn’t that how it goes? I was given a baby shower on Saturday and it was so nice. I got to see a lot of people and got to meet my friend’s new baby (who is my baby’s new friend!). That night was spent organizing and putting some things together…and falling asleep on the couch. It was a very long day and I probably should have napped after the shower. But I got better sleep knowing that things were organized! 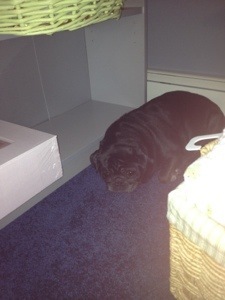 I think we stressed out the pug though. He looked so overwhelmed, but it looks good on him. Sunday was set to be football and dinner but turned into shopping, football, stopping by to see two sets of family and dinner. I tried to stay off the computer to be more productive and was able to get some more things put away and we managed to make it to the food store. Grocery shopping is probably my least favorite thing to do and they are renovating our store. Things are moved around, checkout aisles are slim and each one seems to have a caveat – no credit, no cash, no receipts. There was also very little produce and the freezer looked to be broken. Not the most fun errand, but it was appreciated when I woke up Monday and had some food! Monday we started three weeks of childbirth classes. There was a guided meditation at the end and if we were graded, we would have failed. My husband started laughing, causing me to laugh, causing him to laugh more. If you haven’t heard of The Giggle Loop, I don’t recommend you find out. Because then you’re in a giggle loop, thinking about the giggle loop, and that’s a double giggle loop. I apologized to the couple next to us and the instructor. We were that bad. But we learned a bit, laughed a bunch, and hopefully next week we can keep it together (though I doubt it). Also this weekend I hit 365 days of logging in to My Fitness Pal. I have known I was pregnant for over half that, so I’m super proud of myself for keeping a streak! I also logged in through two vacations and the holidays. I hope to keep it going and I love that they keep track! Ready for some football…sort of! Tonight starts football season. So I’ll be spending time with my computer and the Giants. I doubt I’ll make it through the game as I’ve been tired all day, but I will do my best! Night games are always tough for me. Typically, I would try my best to stay up and workout after work the next day so I could sleep in a few hours. That isn’t an option as I have plans tomorrow night (busy bee!) and have a difficult time exercising after work now anyway. Up at 5am it is. I have decided to do less practicing of Turbo Kick rounds and do more of it just as a workout. I have reached a point where I am modifying so much that it is tough to remember the higher impact moves. I find it is easy for me to learn with the high impact and know how to modify than the other way around. I’m looking forward to still using Turbo Kick and Turbo Fire workouts during the remainder of my pregnancy, even with modifications. Lifting a little of the stress from wanting to commit the moves to memory as I workout should lead to me choosing them even more than before. Still my favorite cardio! I love that the Turbo Fire videos always show a modifier so that it is truly a workout suitable for many levels. So many workout dvds I have seen show a modification for a moment and then the instructor is back to the higher impact option. Turbo Fire (along with Turbo Jam) always has someone showing a lower impact, but still intense, option.